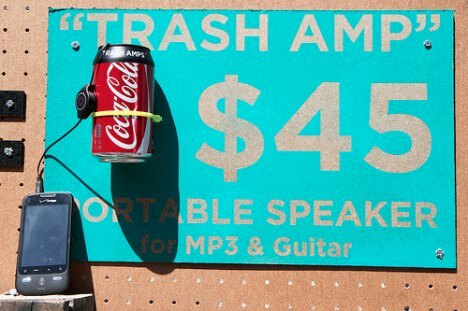 There are two new DIY inventions out there that turn trash into speakers: Vibroy Vibrating Speakers and Trash Amp. There are a few refreshing twists to these gadgets; not only do they reverse the usual electronics-into-e-waste life cycle by adopting throw away objects as integral parts of sound systems, but in doing so, I imagine excited adults running around, pressing their speakers into found objects, recycling bin items, and discarded debris. 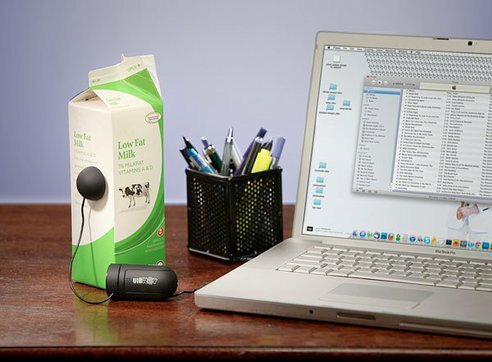 How does this milk carton sound? How does this soda can sound? How does this old shoe sound? This box? This ramen noodle package? This trash can? This abandoned car? Remember when you discovered magnets when you were a kid? Now trash has its corollary. This entry was posted in e-waste, Repair & Maintenance. Bookmark the permalink.